The active engagement of communities in their urban spaces unleashes in them new understanding of their urban surroundings, to open up channels of dialogue between individuals and groups through a device that makes the unpacking of urban space part of a game. 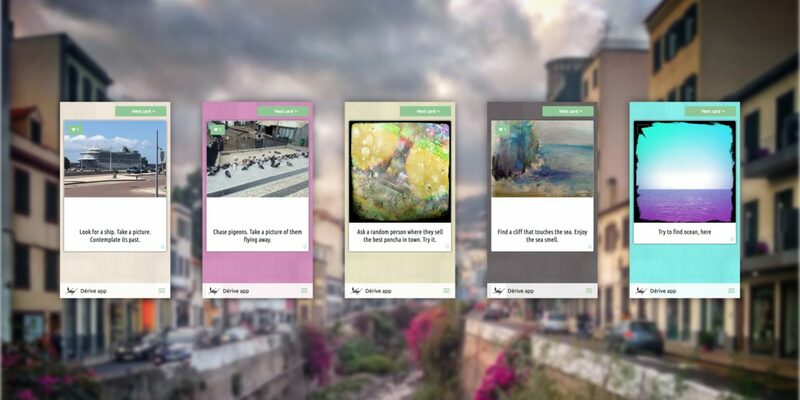 The task cards that are dealt are created with the intention of heightening the experience of the city for the user, by calling them out to search for specific architectural, urban or social points of interest, thus allowing users of the application to see their urban spaces in a different light. Besides the Situationists, inspiration came from, amongst others, Near Future Laboratory and UrbanWorks. Derive app offers several decks of general urban tasks. These decks contains all directives that could be used across multiple urban spaces. The cards can be combined with whichever unique cards are created for a city. You can help us expand Dérive app by creating your own deck of task cards and managing your own group of players.